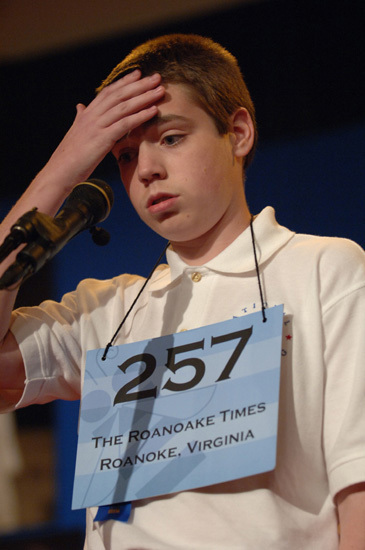 Egads. The fact that people are opening this Mytob virus despite the utter illogic of its social engineering is scary enough, but what’s even more scary is how much of a bandwidth eater it and others of its ilk are. 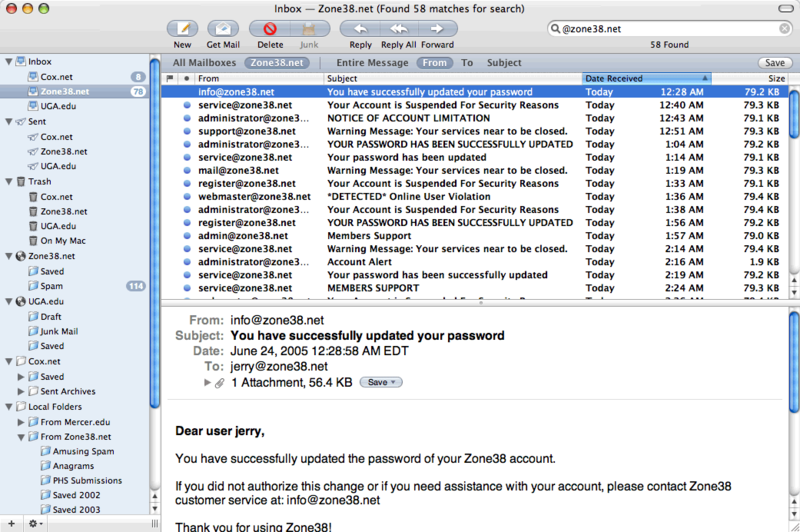 Here’s a screenshot of what greeted me when I checked my mail late this afternoon, after spending the morning and early afternoon on a trip away from the computer. LOL. Someone’s trackback-spamming my blog with a link to “http://thebest-pills/weight-loss-pills.html”. I’m not leaving anything out of that URL– that’s exactly what they posted. Yes, that’s right. No top-level domain whatsoever. Talk about pointless spam. Well, I’m visiting UGA‘s campus right now, and the good news is, I think I can get around the campus fairly well now. I hate this world sometimes. I hate my sense of direction. I seriously wonder how I’m ever going to find my way around the University of Georgia campus, much less around its surroundings… and the pedestrian-unfriendly bus maps I’ve mentioned in the past don’t help things a bit. So, well, I’ve decided to take matters into my own hands. Based upon the VBScript offered in this OSNews guide, I’ve hacked together a rather rudimentary AppleScript to take a music video URL copied to the clipboard and open the direct link to that video stream. So, without further ado, here’s the script; share and enjoy. I’ll gladly take down this script as soon as Yahoo decides to support some OS X native browser… and until then, this isn’t exactly stealing any ad revenues from Yahoo, since video ads don’t show up in Netscape 4.7 either. Edited 2006/03/23 to add: Yahoo fiddled with their links a while back so that this particular script doesn’t appear to work anymore. I recommend using Firefox together with PKLaunch, which does the job admirably. Oooops. 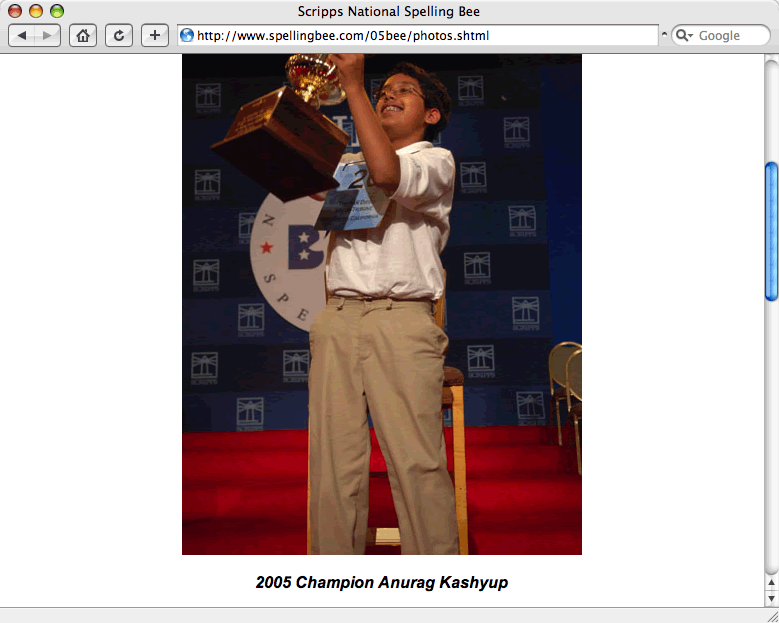 The Scripps web team seems to have misspelled champion Anurag Kashyap’s name on the Photo Gallery page.